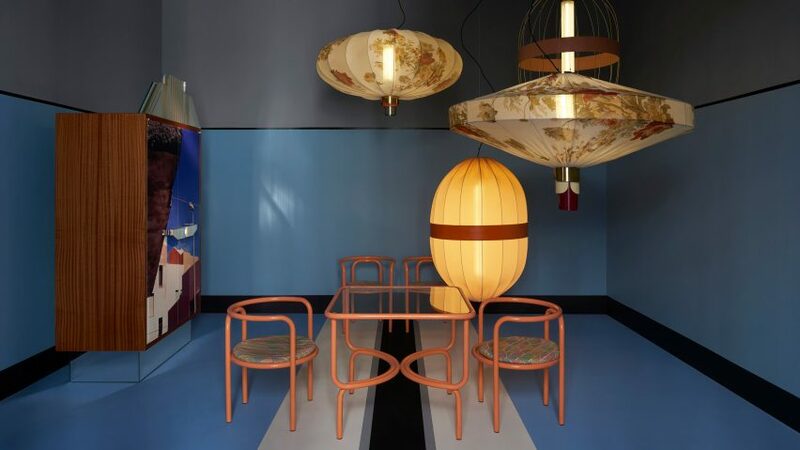 Art deco, 1950s car detailing and 1970s interior styling featured in the colourful rooms created by Dimore Studio to showcase its furniture at Milan design week. The Milan-based studio, founded by Emiliano Salci and Britt Moran in 2003, filled two exhibition spaces in the Brera district with its lighting, furniture and hand-painted tiles. The pieces in the first exhibition, located in an apartment on Via Solferino, referenced the art deco period as well as vintage design details from other eras – like the shapes of 1950s car radiator grills. The show opened with a wall completely covered in patterned tiles, which Dimore Studio designed to resemble multifaceted origami. The studio also added giant striped and wavy graphics to the floors throughout the space, meaning to create movement in the manner of artist Gianni Piacentino. Mirrored details were also a recurring feature, incorporated into table legs, wardrobe doors and armchair backrests. "Mirrors that duplicate and replicate the world, invert left and right, amplify landscapes and transform the space according to the position of those who observe it," said Dimore Studio. Colour was used throughout the art deco-period apartment, with rooms painted in contrasting shades of pale blue and pink. Dimore Studio adopted a similar tactic for its earlier work on skincare brand Aesop's second Milan store, which was completed in 2016. For the exhibition on Via Solferino, Dimore Studio placed just a handful of pieces in each room. This included a dining room with bright pink furniture and oversized Chinese lanterns decorated in flowered fabric. Another area replicated the feeling of a 70s living room, with thick carpet and oversized sculptural seating. A second exhibition, at Circolo Reduci E Combattenti on via Alessandro Volta, showcased the studio's latest collection of garden furniture and textiles. Blending a mix of cultural influences, the Veranda show took place under a pale balloon-covered ceiling. The rest of the space was decked out in pastel blue, and featured a mass of greenery intended to create a "garden of wonders" for visitors. The exhibition included several pieces of outdoor furniture, including tables, chairs and a chaise longue made in slender enamelled iron and decked out in patterned fabrics. To create the textile collection, the studio borrowed architectural details from urban environments, as well as creating materials in more conventional striped patterns in blue, green and gold. The exhibitions were on display at Via Solferino 11 and Circolo dei Reduci e Combattenti on Via Alessandro Volta 23 from 4 to 9 April during Milan design week. Other furniture exhibitions on in Milan last week included a set of benches made by Max Lamb using waste cotton and wool, and the Sets display by Matteo Zorzenoni, which placed his designs in styled boxes.